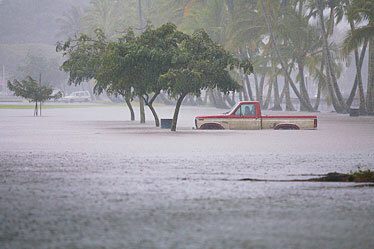 A driver sits in his stalled truck in a parking lot on Kamehameha Avenue in Hilo yesterday, waiting for floodwaters to recede, as heavy rains on the east side of the Big Island resulted in swollen rivers and flooding of low-lying streets. Homes flooded, major highways closed and officials urged residents to stay in their homes after heavy, continuous rains caused flooding on the Big Island yesterday. "The situation in Hilo is critical and a life-threatening situation now," said Big Island Mayor Harry Kim. "Many places have been endangered in regards to flooding, and voluntary evacuation has been occurring." Kim, who is also acting administrator of Big Island Civil Defense, declared a state of emergency for the Hilo, Puna, and Kau areas at 1:30 p.m.
As much as 18 inches of rain fell in the Waiakea Uka area in 24 hours. Heavy rains were also reported in East Maui. The National Weather Service said the heavy rains may move over Oahu and other islands and have issued a flash flood watch through this afternoon. On the Big Island, parts of highways 19 and 11 were closed, leaving Saddle Road as the only artery into Hilo, said Pat Engelhard, Hawaii county's director of the Department of Parks and Recreation. "We're just telling people to stay off the highways," Kim said. "We've asked all events to be canceled including athletic events and any recreational events that are not necessary." The Hilo Bayfront Highway was also closed by flooding. Enbgelhard said Alenaio Stream and Waiolama Canal were overflowing, putting Kamehameha Avenue under three feet of water. 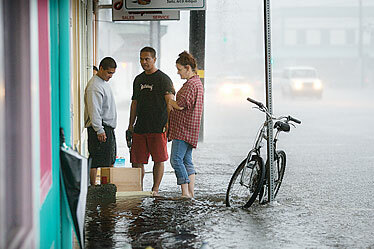 Heavy rains on the east side of the Big Island resulted in swollen rivers and flooding of low-lying streets. The National Weather Service says heavy rain could move over Oahu. Part of a Wailuku River bank collapsed from the heavy rainfall, sending a chunk of earth about 60 feet high and 50 feet wide into the river near an apartment complex, but the building was not affected and no one was injured, Engelhard said. Voluntary evacuations were being held in the Waiakea Uka area and authorities were going door to door to warn residents about the situation, Kim said. The American Red Cross opened an emergency shelter at Afook Chinen Civic Auditorium for residents who couldn't access their homes because of flooding. But a spokeswoman said as of 6 p.m. yesterday no one had shown up at the shelter. Officials had planned to open the shelter at the Puueo Community Center, but changed the location after the parking lot there flooded. The Weather Service said Honolii Stream overflowed by about three feet and sent sheets of water flowing down people's lawns. "The roads are becoming streams and the streams are raging," Houston said. "It's definitely still a critical situation over there. Still more rain following and nowhere to go." "It's pretty heavy and steady," said Bob Arakaki, an employee of the Hilo Municipal Golf Course. "We got lakes all over the place, on the greens and the fairway." Officials suspended play at the course as runoff filled normally dry streams and flowed over bridges about four or five feet above ground. "This is one of the worst days," Arakaki said. These are some 24-hour rainfall totals for areas on Maui and the Big Island, through 5 p.m. yesterday.